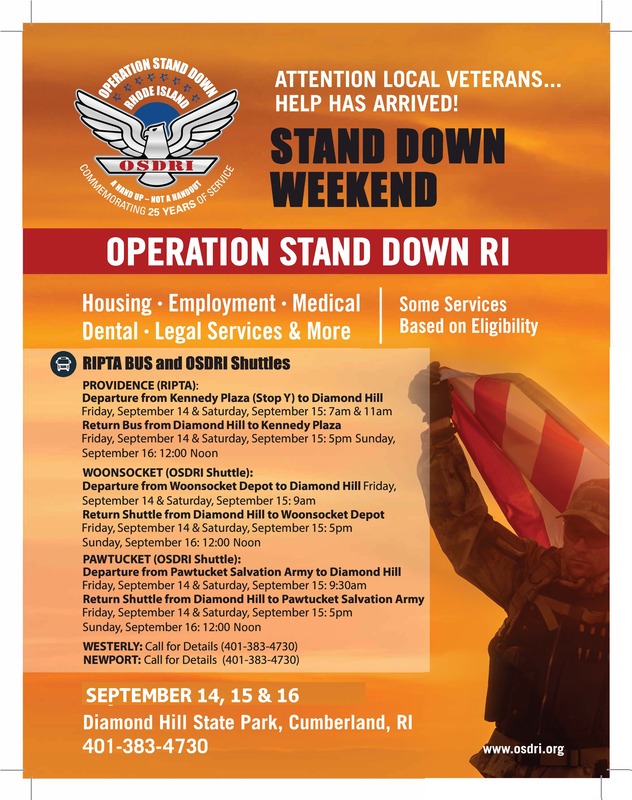 Join us for our Annual Stand Down Outreach Weekend scheduled September 14th ,15th & 16th.Operation Stand Down RI sets up a military style encampment at Diamond Hill Park in Cumberland, RI and invites service providers from across the state to join us to deliver life essential services to veterans in need. In 2017, approximately 500 homeless and at-risk veterans attended Stand Down Weekend. Additionally, more than 200 volunteers and over fifty nonprofit, state and federal agencies came together at the outreach event to provide the veterans with services including housing assistance, medical, dental, benefit claims, mental health care, legal assistance, DMV services, financial planning, employment and training resources, basic human needs assistance and much more.